For other uses, see Prospero (disambiguation). Prospero (/ˈprɒspəroʊ/ PROS-pər-oh) is a fictional character and the protagonist of William Shakespeare's play The Tempest. Prospero is the rightful Duke of Milan, whose usurping brother, Antonio, had put him (with his three-year-old daughter, Miranda) to sea on a "rotten carcass" of a boat to die, twelve years before the play begins. 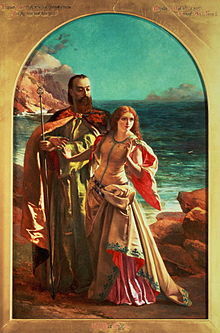 Prospero and Miranda had survived and found exile on a small island. He has learned sorcery from books, and uses it while on the island to protect Miranda and control the other characters. —  The Tempest, Act 1, scene 2. Prospero's sorcery is sufficiently powerful to control Ariel and other spirits, as well as to alter weather and even raise the dead: "Graves at my command have waked their sleepers, oped, and let 'em forth, by my so potent Art. "- Act V, scene 1. On the island, Prospero becomes master of the monster Caliban (the son of Sycorax, a malevolent witch) and forces Caliban into submission by punishing him with magic if he does not obey. Ariel is beholden to Prospero after he is freed from his imprisonment inside the pine tree. At the end of the play, Prospero intends to drown his book and renounce magic. In the view of the audience, this may have been required to make the ending unambiguously happy, as magic was associated with diabolical works; he will drown his books for the same reason that Doctor Faust, in an earlier play by Christopher Marlowe, promised in vain to burn his books. The Tempest is believed to be the last play Shakespeare wrote alone. In this play there are two candidate soliloquies by Prospero, which critics have taken to be Shakespeare's own "retirement speech". One person's speech is the "Cloud-capp'd towers...". The final soliloquy and epilogue is the other candidate. Sir Michael Redgrave played Prospero in a BBC Play of the Month production in 1968. Heathcote Williams played Prospero in Derek Jarman's 1979 film version of The Tempest. Sir Michael Hordern played Prospero in a 1980 production for BBC television. A Stratford Shakespeare Festival production was videotaped and broadcast on television in 1983, starring Len Cariou as Prospero. Paul Mazursky's film, Tempest (1983), features a Prospero-esque character portrayed by John Cassavetes who is an exile of his own cynical discontent, ego and self-betrayal and who abandons America for a utopian "kingdom" on a secluded Greek isle. In Peter Greenaway's film Prospero's Books (1991), Prospero is played by John Gielgud. Helen Mirren plays a female version of the character, renamed Prospera, in Julie Taymor's 2010 film adaptation of the play. BBC Radio 3 broadcast a production of The Tempest (7 October 2001) adapted for radio and directed by David Hunter, starring Philip Madoc as Prospero, Nina Wadia as Ariel, Josh Richards as Caliban, Catrin Rhys as Miranda, Andrew Cryer as Ferdinand, Rudolph Walker as Gonzalo, James Laurenson as Alonso, Christian Rodska as Sebastian, and Ioan Meredith as Antonio. David Warner played Prospero in the BBC Radio 3 Drama on 3 production of The Tempest, broadcast (on 6 May 2012) as part of the Shakespeare Unlocked series on the BBC. The production included Carl Prekopp as Ariel, Rose Leslie as Miranda, James Garnon as Caliban, James Lailey as Antonio and Peter Hamilton Dyer as Sebastian, and was adapted for radio and directed by Jeremy Mortimer. Richard Cox portrays Prospero in the second season of the TNT series The Librarians. This version of Prospero is a Fictional, a character brought to life by magic, and has become bitter over the way his story was written, as he feels it was made without his consent. After regaining his book and obtaining the Staff of Zarathustra, he imprisons the Librarians within his illusions, but his servant Ariel (who is an actual fairy rather than a character) rebels and frees them. Prospero subsequently begins to reshape the world in his image, while also possessing his creator Shakespeare in order to change the past. The Librarians destroy his staff and exorcise him from Shakespeare's body, banishing him back to his original story. Patrick Stewart portrayed Prospero on a Broadway version of The Tempest. He later participated as Prospero in Rupert Goold's very loose interpretation with The Royal Shakespeare Company in Stratford-upon-Avon. In the comic book series The League of Extraordinary Gentlemen by Alan Moore and Kevin O'Neill, Prospero appears as a founding member of the first such grouping in 1610, alongside his familiars Caliban and Ariel. Paul Prospero, the protagonist of The Vanishing of Ethan Carter (2014), is named after Prospero. In John Bellairs's novel The Face in the Frost (1969), Prospero is one of the protagonists. In The Horus Heresy series, several books take place on a planet called Prospero. The citizens of the planet are versed in sorcery and psychic powers, earning them the suspicion and ire of the rest of the Imperium of Man. Melon Cauliflower, by New Zealand playwright Tom McCrory, is about a man Prospero, in his late sixties, who struggles to come to terms with the death of his wife and has mistreated his daughter Miranda. In the television series Star Trek: The Next Generation by Gene Roddenberry and CBS / Paramount Pictures, Prospero appears briefly played by Lt. Cmdr. Data who is in turn played by the actor Brent Spiner during the beginning of Season 7 Episode 23 entitled 'Emergence'. He recites some lines of Prospero's speech before asking Captain Picard (as played by Patrick Stewart) to provide some insight into the character of Prospero and Shakespeare's The Tempest in general. This may be a fortunate coincidence as Stewart was to appear as Prospero on Broadway the following year, a booking which may have been known by the writers. In the mobile game "Star Trek Timelines" a character was released in February 2017 called Prospero Data recalling the characters appearance in the previously mentioned Star Trek: The Next Generation episode. A good wizard named Prospero appears in Polish children's animated cartoon called "Miś Fantazy" based on the books by Ewa Karwan-Jastrzębska. In episode 1 of the video game Life is Strange: Before the Storm, the drama students of Blackwell Academy are seen rehearsing for their upcoming play, The Tempest. The character, Rachel Amber, playing Prospero. In the popular manga One Piece, a character with the name Perospero appears in chapter 834, partly inspired by Prospero. His mother, Charlotte Linlin also seems to be inspired by the character as she is the one to use magic to control everything on the Island with her soul. The novels and television series The Expanse use several Shakespearean allusions, including "Caliban" in reference to monstrous human-alien hybrids, and correspondingly "Prospero Station", a research facility that was developing and controlling them. In the national bestseller The Night Circus by Erin Morgenstern, magician Hector Bowen, father of protagonist Celia Bowen, goes by the name of Prospero whilst performing. In the season 30 episode of The Simpsons titled 'I'm Just a Girl Who Can't Say D'oh', Sideshow Mel leaves a play Marge is directing to play Prospero and is replaced by Professor Frink. ^ "The Tragical History of Doctor Faustus, by Christopher Marlowe". www.gutenberg.org. Retrieved 20 September 2017. ^ a b c Shakespeare, William (1913). "Act 4, Scene 1". In Horne, David (ed.). The Tempest (Revised hardcover ed.). New Haven: Yale University Press. p. 72. ...it was probably Shakespeare's last effort. ^ a b c Jacobs, M W. "Shakespeare's Parting Words". HuffingtonPost. Retrieved 16 June 2017. ^ a b Shakespeare, William; Guthrie,Tyrone (1958). "The Tempest". In Alexander, Peter (ed.). The Comedies. New York: The Heritage Press. p. 4. Shakespeare himself was at the end of his career, and it is hardly possible not to see,...in Prospero's resignation of his magic a reflection of Shakespeare's own farewell to his art. ^ "On The Vanishing of Ethan Carter's Ending (EXTREME SPOILERS)". Retrieved 7 October 2015. ^ "Prospero Burns publisher summary". Archived from the original on 13 October 2015. Retrieved 17 October 2015. ^ McCrory, Tom. Melon Cauliflower (PDF). RadioNZ. Archived from the original (PDF) on 30 June 2013. Prospero is the main antagonist in season 2 of The Librarians on TNT. "Miś Fantazy". vod.tvp.pl. Retrieved 22 December 2016. Wikimedia Commons has media related to Prospero.